Jordan Betts came up big with a clutch RBI double in the bottom of the eighth to put Salem ahead for good in a tight win. The third baseman went 2 for 4 on the game. Jose Sermo drove in Salem's other run in the bottom of the first. Kyle Hart was solid in five innings of work, giving up just one run on six hits while walking three and striking out five. Adam Lau was credited with the win, throwing two no-hit innings of relief. He did walk three batters, but managed to escape an eighth inning jam. A big sixth inning keyed the comeback for Greenville, as a pair of runs scored on wild pitches and a two-run home run from Jerry Downs put the Drive up for good. The clutch homer was Downs' first of the season. Jagger Rusconi went 2 for 4 with a run driven in. Jhonathan Diaz picked up his fifth win, giving up three runs in five innings of work. 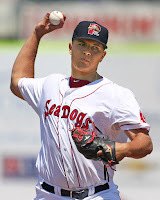 After fourth-round draft pick Jake Thompson got a shutout inning of work in with two strikeouts, Dakota Smith pitched six dominant innings of relief for the Spinners. The 24-year-old righty did not allow a run, giving up just three hits while walking one and striking out three. Marino Campana went 2 for 4 with a double, an RBI and a run scored. The GCL Sox held off a late Rays rally to complete the system sweep for Tuesday. Pedro Castellanos carried the offense, going 3 for 4 with a home run, three runs scored and three RBI. Edilson Batista picked up the win with five shutout innings of work. He allowed just two hits and did not walk or strike anyone out. Rain washed out Tuesday's DSL matchup against the Rays. No makeup date has been announced. Player of the Night: Giving up just a pair of hits in eight stellar innings, Kevin McAvoy gets the nod. In what has been an up and down season for the 24-year-old Syracuse native, the win was McAvoy's longest outing of the season. McAvoy had been on a nice run before landing on the disabled list in mid-July. The seven strikeouts also tied a season-high for the righty.